Pondicherry, generally known as Pondy was under the French rule until 1954. One can still see and feel the polished vision of the French-inspired esthetics in the work of Indian artists and designers here. Pondicherry is the ideal weekend getaway for the travel enthusiasts looking for a respite from the fast city life. All one needs to do is to book one of thehomestays in Pondicherry or a hotel for a comfortable and memorable stay. There is plenty to do and see here in the city with a faded colonial-era villas and a more bohemian-chic atmosphere. Aurobindo Ashram, the internationally famous spot lies towards the north of town and draw vast numbers of spiritual minded visitors. Serenity Beach, Rock Beach, and Paradise Beach are very popular spots. Explore the city to look at the French-inspired architecture and colonial villas. While there are many options for lodging and accommodation in Pondicherry, homestays in Pondicherry are considered the best as they offer a comfortable stay at lower costs. Thus, those looking for privacy and comfort well within reach should undoubtedly try out those accommodations. After all, it feels great to come back to a room, which is like your very own and you can enjoy full privacy and comfort. 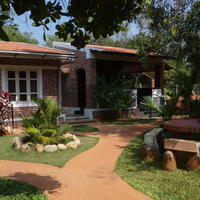 These homestays are just perfect for a family vacation and provide a unique and fun experience for all. The homely and budget-friendly properties offer a wide range of portions based on your preferences. Enjoy a wide range of amenities, such as AC rooms, 24-hour help desk, TV, and attached bathrooms according to your budget. You can always ask for an additional bed too if you have children. You can head towards a coffee shop for some chit-chat over coffee or visit a nearby restaurant for some great cuisines. A fully-equipped kitchen means that you can prepare your own meals. An additional advantage is that one is never far from the famous localities and famous landmarks of the city. The railway and bus station and those beaches are nearby. There are a large number of Pondicherry hotels and homestays; and if you are wondering where to find the best stay options and deals, just browse Cleartrip. We have a wide range of homestays, guest houses and serviced apartments in Pondicherry for travellers with varying budgets. All you need to do is make comparisons, look at the facilities and find one that fits within your budget. There are several options for elegant homestays in the city and out of them Inn Pondiville makes for a good choice. The property enjoys prime locations and great reviews from the guests who have stayed here. You can certainly look forward to a comfortable stay here and would never be far from the major tourist attractions. Get ready to explore the popular tourist destination in South India, famous for its colonial buildings, temples, and churches. You are carried to another world as you explore the major attractions here. Explore the city and its broad clean roads lined with French style houses. Pondicherry is indeed a paradise for any beach-lover. Cleartrip is careful about listing only those properties that offer great value to your vacation. The staff of these accommodations go that extra mile to serve you and even organise some great arrangement for you. These accommodations are run by professionals who are well-experienced in the field of hospitality and guest services. Start online research early so that you can complete your booking hassle-free, or you might miss out on the fabulous deals offered by Cleartrip.com. Due to the popularity of the city and its attractions, there is always a massive rush for the place. Hurry to avoid any last minute disappointments and grab the best deals!